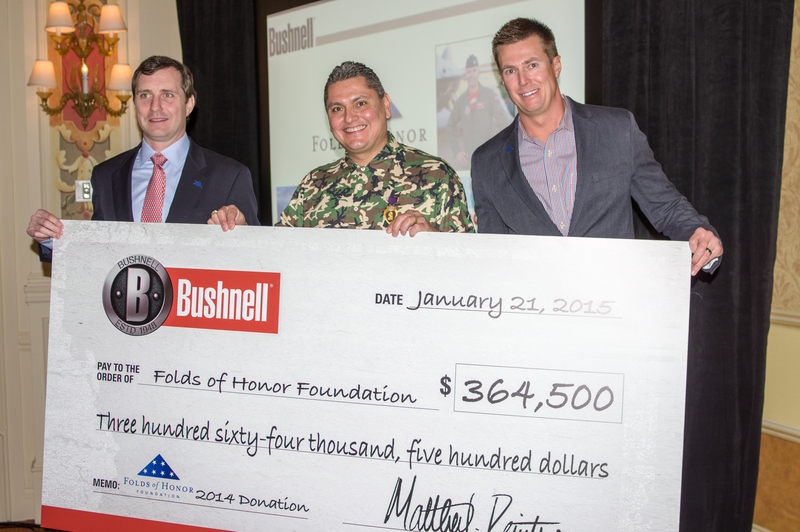 Overland Park, Kan. — Bushnell, an industry leader in high performance sports optics and outdoor accessories for more than 65 years, has announced its 2014 contributions to Folds of Honor Foundation totaled $364,500. Since establishing a partnership in 2010, the optics leader has donated more than $1,000,000 to Folds of Honor. Founded by Major Dan Rooney in 2007, Folds of Honor provides educational scholarships to the spouses and children of service members killed or disabled during U.S. military service. Major Rooney, a former F-16 pilot who served three tours in Iraq, founded Folds of Honor to ensure that families of fallen service members are never left behind on the field of battle. According to the foundation, more than 1.4 million dependents have been affected by the wars in Afghanistan and Iraq alone, with 85 percent of those not qualifying for federal educational assistance. Without the help of civilian organizations like Folds of Honor, many of these families would not receive aid. “With support from partners like Bushnell, we’re able to help lift up military families and honor the sacrifice our service men and women make to protect our freedom,” said Major Dan Rooney, Folds of Honor founder. Since its formation, Folds of Honor has awarded thousands scholarships to deserving families across the nation and provided necessary assistance to many more. The foundation continues to support the needs of the spouses and children of fallen or disabled service members, and encourages all citizens to do the same. For more information about the Bushnell and Folds of Honor partnership, visit www.bushnell.com/global/company/folds-of-honor. To learn more about Folds of Honor and to join the mission, visit www.foldsofhonor.org.